This photo shows Capitan Island, which shelters the southern end of Tamarindo Bay. The island is just north of San Francisco Point, which I showed two days ago. In Spanish, Capitan Island is called Isla del Capitan. It takes its name from a legend that a captain of a ship that wrecked on rocks off shore swam to the island for safety. The island is a place where people can swim or kayak. It is very small and almost disappears at high tide. 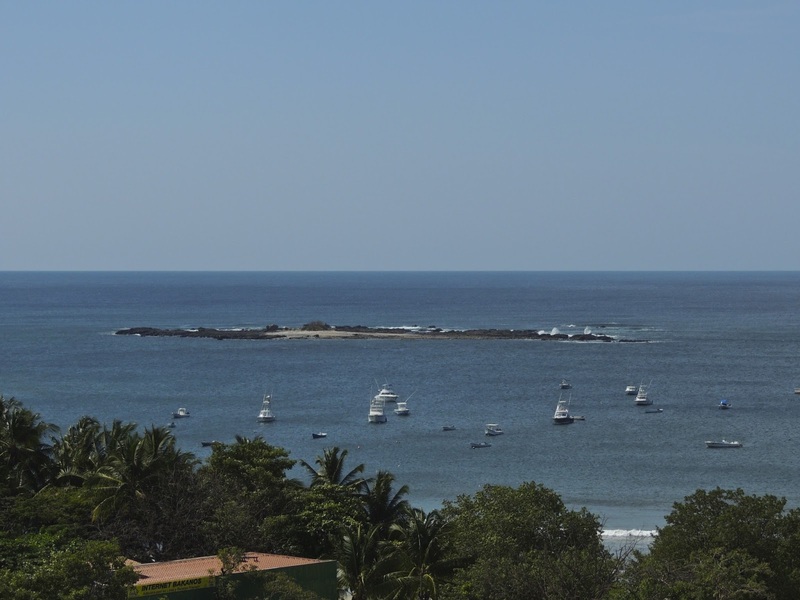 It provides a safe place for boats to be moored in Tamarindo Bay, as is shown in this photo from the walkway in front of our Diria condo. This week we are showing photos from Cabra Castle, a castle-hotel northwest of Dublin Ireland, on our Viva la Voyage travel photo site. This is a closer view of the same scene as yesterday's post, showing the southern part of Tamarindo beach, taken from the front of our Diria condo. The tall building reaching above the tree canopy is the Crystal Sands condo on Langosta Beach. It is 7 stories tall. If it were 4 stories tall, it would not be visible from a distance. Most land near the beach is now restricted so that tall buildings can no longer be built along the beach. Some of the land is grandfathered so that the right to build near the beach is preserved. The land ownership rights are complicated, but in the future there will be fewer, and shorter, buildings on the beach, and developers will be required to keep half of the land in vegetation rather than buildings, parking lots, and sidewalks. 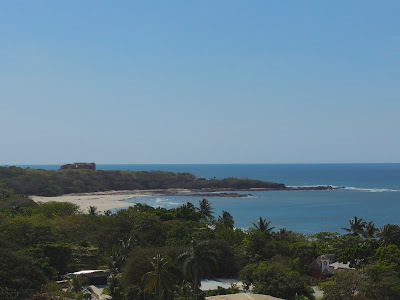 This is a view from in front of our Diria Resort condo out to the southern end of Tamarindo beach and bay. This shows the San Francisco Point, which is the dividing point between Tamarindo beach and Langosta beach, which stretches to the south on the far side of the point. 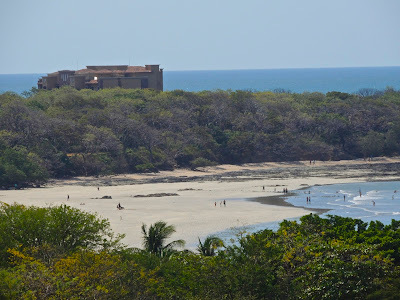 This photo shows how the southern end of Tamarindo beach is sheltered from the full waves of the ocean by the point and the reef that extends from the point into the ocean. I took this photo at low tide. During high tide more of the rocky point is below the surface of the water. Our condo at the Diria Resort is above the resort's large lagoon-shaped swimming pool, which is 10,000 square feet (929 sq. m.)., the largest in Tamarindo. Although the pool is large. most of it is hidden from view by the palm trees that are in the coves and islands that are part of the Diris Resort's pool landscaping. 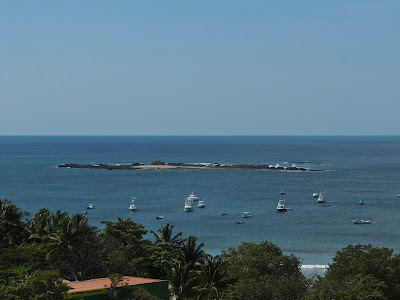 This is the view from our condo balcony over the trees of the Tamarindo Diria Resort to the beach and across Tamarindo Bay to Cabo Velas. Our condo is on the 4th floor, which is high enough to be above the palm trees and hotel units the lie between us and the beach. The far row of palm trees in this photo line the beach. Often people who consider renting our condo will ask how far it is from the condo to the beach. This photo shows that distance. It is about 100 yards, an easy walk through the beautify grounds of the Tamarindo Diria Resort. We do not tire of this view. We have this view from our balcony, from our living room, and from the master bedroom. This week we are showing some photos of Paris, featuring several of its museums. on our Viva la Voyage travel photo site. It occurred to me that I have shown lots of photos of sunsets and ocean views from our condo right on the beach in the Playa Langosta area of Tamainrdo, but I have not shown many photos of the view from our condo at the Tamarindo Diria Resort in the middle of Tamarindo. Today I will start a little series to cure that oversight. 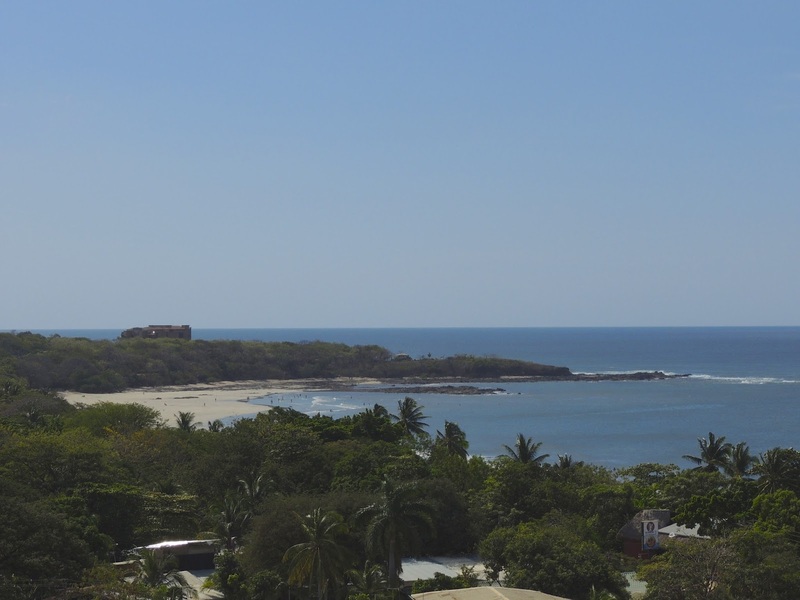 This is a photo from our condo balcony looking north across the mouth of the Tamarindo estuary towards Playa Grande. 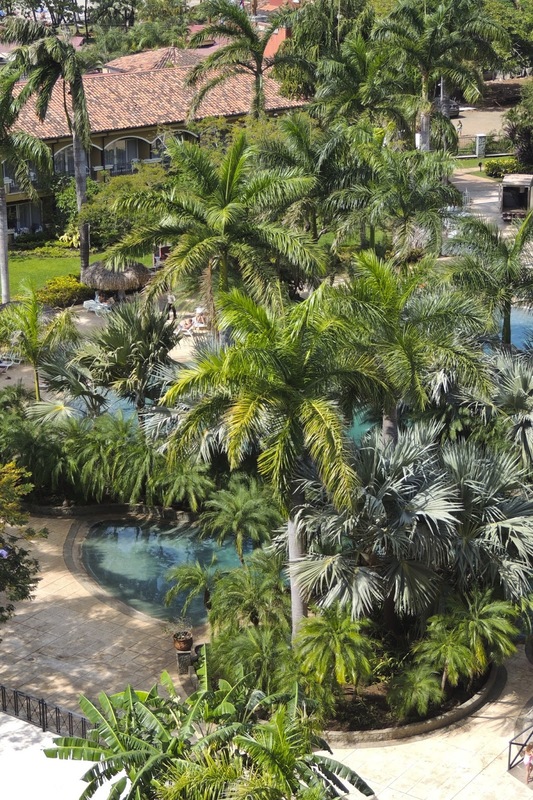 The trees in the foreground are part of the grounds of the Tamarindo Diria Resort. The main part of Tamarindo beach is straight out to the ocean to the left of this scene, but I like the view to the north as well. I will show the view to the west tomorrow and in the coming days. Yesterday was a holiday in Guanacaste, the northwest province of Costa Rica. It was not a national holiday. It was Annexation Day, celebrating the vote on July 25, 1824 during which Guanacaste voted to be a part of Costa Rica rather than Nicaragua. Thank goodness. 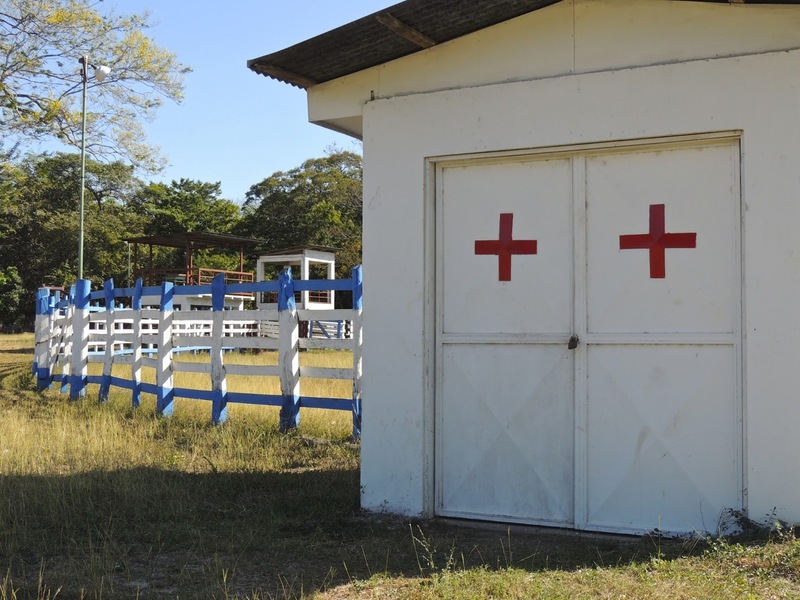 The rodeo grounds in Santa Rosa have a small building for medical care for people injured at the rodeos. I guess that is a reflection that rodeo riding can be dangerous. I guess it is human nature to challenge ourselves, even if it can risk injury. I am a lot more cautious now than I used to be, in recognition of the fact that tomorrow I will turn 62 years of age and I am not in as good physical condition as I used to be. In my younger days, I enjoyed activities such as snow skiing, and I have 29 stitches in my head from a bad skiing accident to prove it. 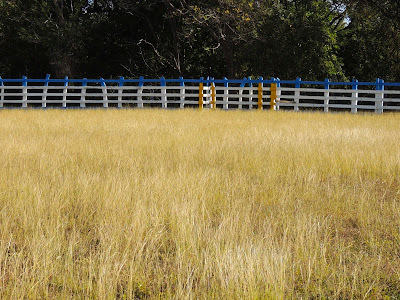 The photo of the tall grasses that I showed yesterday were right in the middle of the rodeo corral in Santa Rosa. I took the photo back in December, which was not the active season for the rodeo, as evidenced by the fact that the grasses had grown so tall. I apologize, but I have not been able to show photos from my December trip until now because my laptop has been at capacity and I have not been able to download them. My wife is in the process of reorganizing our desktop computer photo storage capacity, but it is hard to find the free time to work on that time consuming project. I am glad she takes on that responsibility. 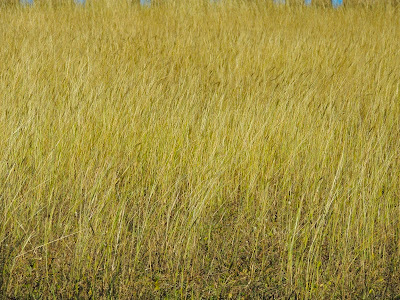 This field of tall grass was waving in the wind, and its golden color attracted me. Tomorrow I will show a wider view to place this into perspective. A little news item that shows the strength of the tourism sector in Costa Rica is that they have just announced an 18% expansion project to add two more gates and jetways to accommodate larger airplanes at the Juan Santamaria International Airport in San Jose. This will add the capacity for 260,000 additional passengers per year. 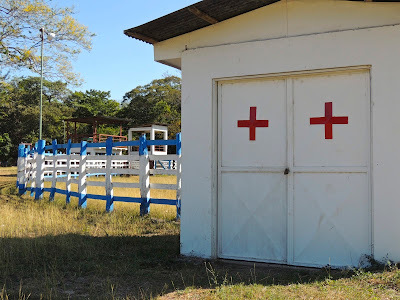 Most visitors to Tamarindo fly into the international airport in Liberia, which is only on e hour away, rather than San Jose, which is 4 1/2 hours away, but the extra air service will help the entire country. 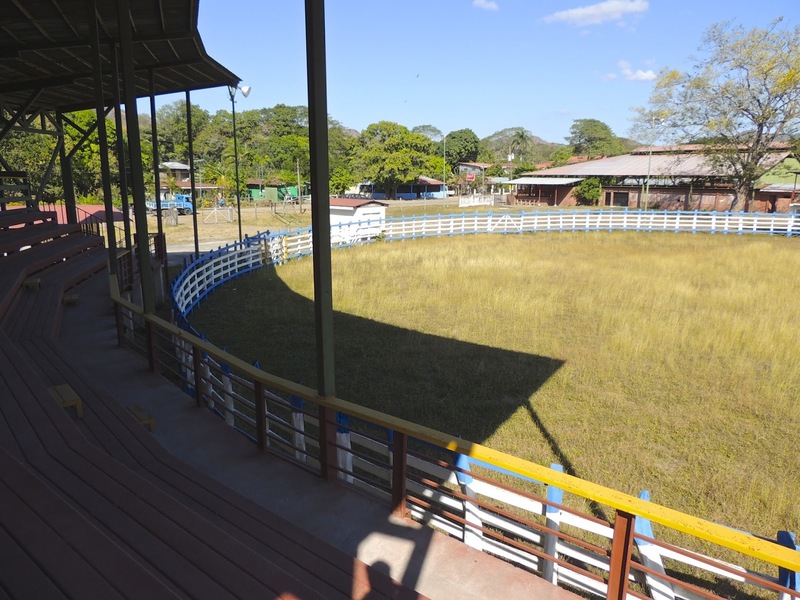 This is a view of the rodeo grandstand and ring in Santa Rosa, a small village northeast of Tamarindo. I will need to return some time when they are having a rodeo. Santa Rosa is a village about 5 miles (8 km) inland from Tamarindo. 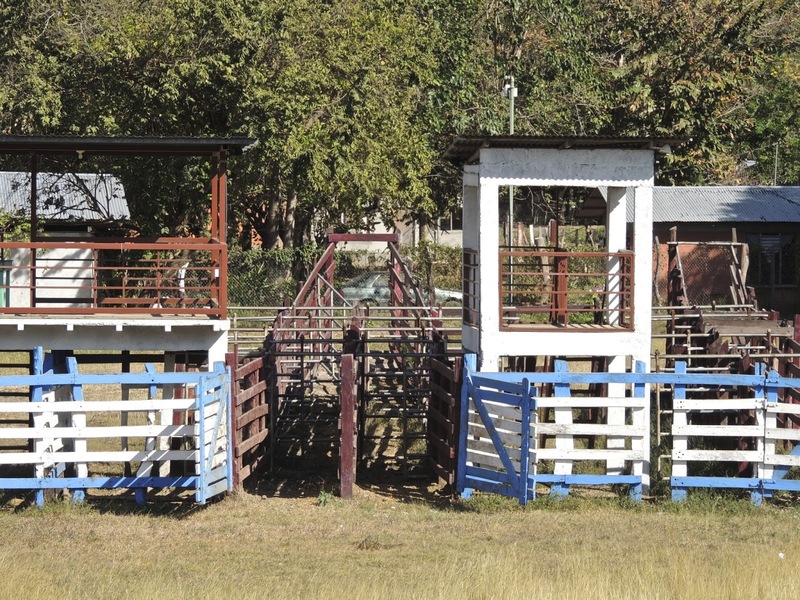 It has what in the USA would be called a rodeo grounds. There is an arena with a grand stand for viewers, and holding areas for cattle and horses. Northwest Costa Rica, which is the province of Guanacaste, has a long and proud cattle ranching tradition. Although tourism has replaced cattle and agriculture as the main industry, people still enjoy their rural traditions. Today is Sunday, so we have new photos posted on our Viva la Voyage travel photo site. This week we are showing some photos of Paris, featuring several of its museums. Iguanas are common in the trees in and around Tamarindo. They are harmless. I like the green iguanas better than the brown iguanas. 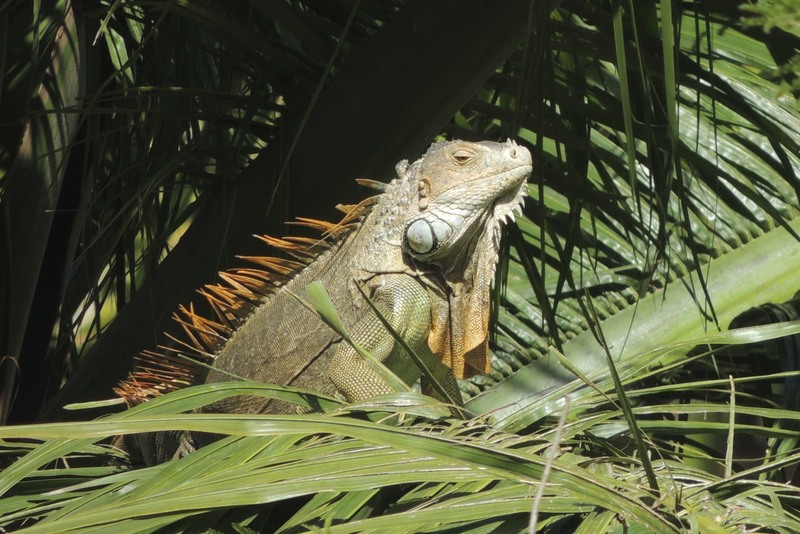 This is a green iguana, of course. In addition to their color, they have other distinctive features, such as the large scale on their jaw, the dewlap hanging from their chin, and the spikes sunning the length of their spine. This week we are showing photos from Tanzania on our Viva la Voyage travel photo site. If watching people, pelicans, and waves are becoming mundane, there are often a few dogs to watch on the beach. 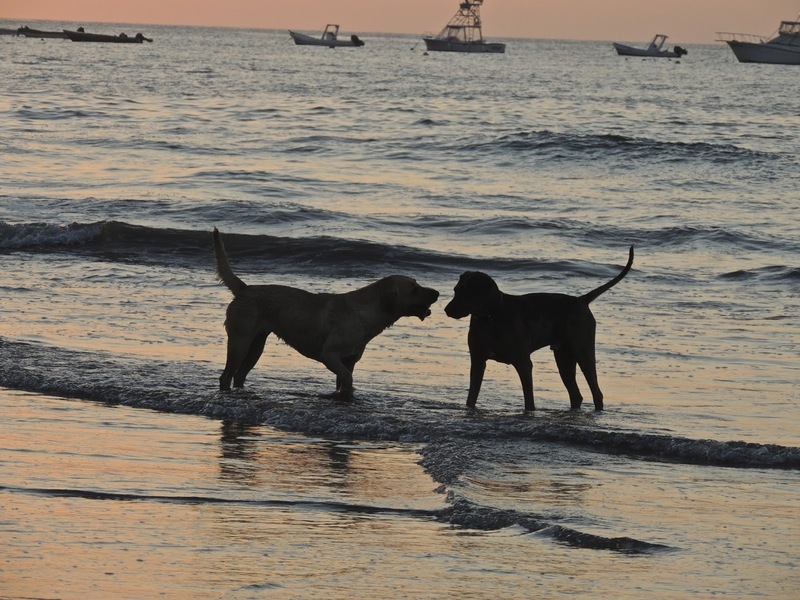 These dogs were greeting each other before they enjoyed romping in the surf together. Yesterday I showed a pelican flying over the beach. Here is another sight that can be seen in Tamarindo -- the gyrocopter flying overhead. My son rode in the gyrocopter several years ago and loved it. I posted a few of the photos that he took. I will have to try it sometime. You get to sit up front in the open air, which would provide great visibility for photos. The gyrocopter takes off from Tamairndo airport and flies down the beach for 15 minute scenic flights. I haven't shown a surfer in a while, so here is a young surfer on Langosta Beach who is zipping down the curl of a wave to stay ahead of the break in the wave. He has left a path of spray that records his maneuver, for an instant. I previously showed some photos of this guy on horseback in the middle of town. Today's photo is not about the horse or rider, or the truck rumbling through town. It is about the sign in the background. 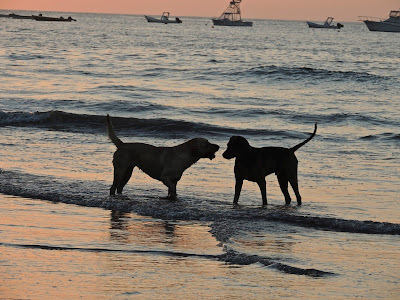 Several Daily Photo bloggers this weekend noted Bastille Day, so I am a little late, but they have prompted me to post this photo as a way to comment about Tamarindo's French connection. The sign in the background advertises a computer business named "Mr. Tom." They provide products and technical support. So what is the French connection? I read a local newspaper article years ago about the owner of the Mr. Tom business, and he is French. Of course they asked him if his name is Tom, and it is not. He said the reason he chose the name is that "Tom" is that people who speak any language can pronounce and understand it. Tamarindo is full of foreigners. In addition to the person who owns Mr. Tom, the people from France include the interior decorators we used for our two condos, the photographer who took the photos of our condos for the websites where they are listed, the lady who runs an activity shop on the main street, and the young woman who works for our property management company and takes excellent care of our guests is also from France. 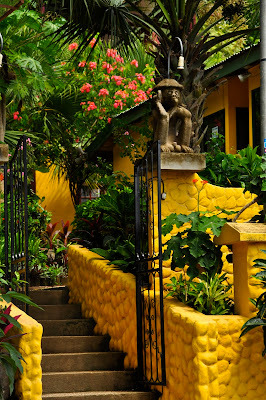 This is Dragonfly, one of our favorite restaurants in Tamarindo. All of the restaurants in Tamarindo are open air. There are no walls, except in the kitchen and bar area. People can enjoy gourmet food wearing shorts, t-shirts and sandals in the casual ambiance of a tropical beach town. Dragonfly is one block away from the main tourist zone, so people need to make the effort to walk down a little unpaved road to find it, but it is worth the effort. Today is Sunday, so we have new photos posted on our Viva la Voyage travel photo site. 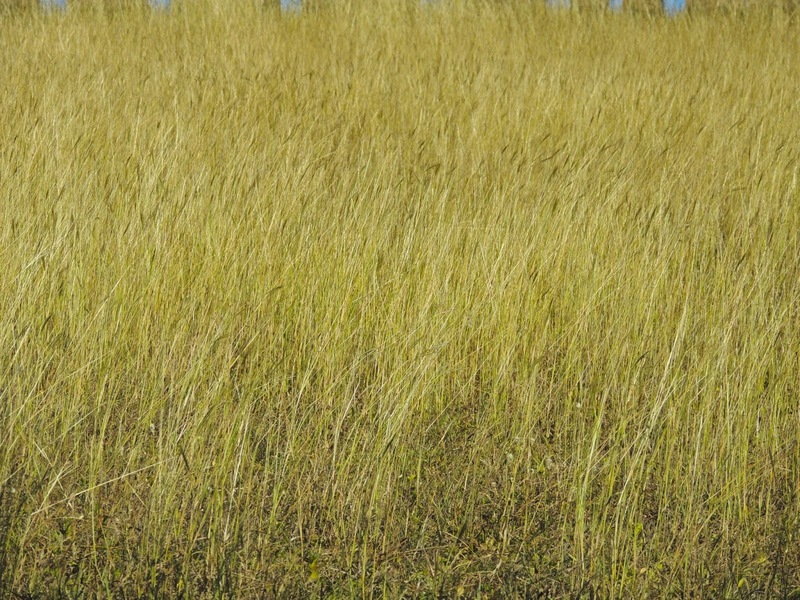 this week we are showing more photos from Tanzania, including a lioness peering up from the grass. I have shown a few photos lately of howler monkeys crossing the road near our condo. Today I am showing a photo of a howler in a more natural setting, up in a tree. I had to shoot the photo through the palm fronds of a tree near our condo. Their howls can be heard as far as 3 miles (4.8 km) away. The purpose of the howls is thought to maintain spacing between the territories of different groups of howlers. They travel in groups, sometimes as large as 15. We have photos of the charming town of Adare, Ireland, posted on our Viva la Voyage travel photo site this week. This is the entrance to the Hotel Mono Loco. Most of the hotels in Tamarindo are small, independent hotels with perhaps 10 - 20 rooms. Some of them started as accommodations for surfers when Tamarindo was just a surfing town, and they have been upgraded now that the area is a resort town for a wider range of activities. The Internet is crucial to enabling the smaller hotels to be able to feature themselves to prospective guests. 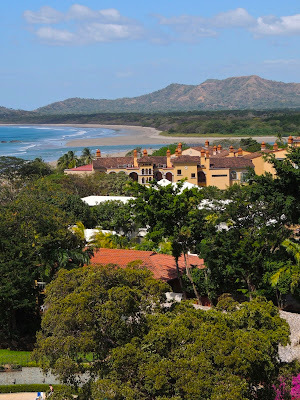 The major exception to the small scale of the local hotels is the Tamarindo Diria Resort, which is large and which I have featured in the past and have an index label in the right margin dedicated to it. It is of a scale that one would expect of a large, multi-faceted resort, with several swimming pools, a tennis court, large beachfront, and they are even developing a golf course on the edge of town. The hotels in Tamarindo are generally not affiliated with any of the international hotel chains, with the exception of the Barcelo Langosta Hotel, which is a Spanish owned chain. There is also a Best Western. The large international hotels, such as the J.W. Marriott, Hilton, Four Seasons, etc. have located their properties in areas where they are outside of town in controlled access areas. My wife and I decided that we preferred being in town, with many dining options and an actual town, not merely a resort. One of the hotels in Tamarindo is named Mono Loco, which translates as the Crazy Monkey. I don't know if that is a good name for a hotel or not. I guess it is memorable, but when staying in a hotel, I would not want anything crazy happening, including any monkeying around. Tomorrow I will show you what the hotel looks like. Yesterday I showed a beachfront house. If you stay on the beachfront, this is what you can see just about every evening. I like to observe the last moments of the sun. I took this photo of the sun dropping into the Pacific from our Langosta condo. A week or so ago I showed some condos on the Tamarindo Preserve development and mentioned that there is a beachfront lot available. This is a nearby beach front home. I took this photo from the road, but behind the trees behind this house is the southern end of Tamarindo beach. A house would be too much maintenance for us, as it is a lot easier to take care of a condo and to rent it out to guests to cover the cost for people like us who own vacation property and do not live in Tamarindo all year. Because of that factor, the price per square foot of houses is a fraction of the price per square foot of condos. I showed some photos of a howler monkey up on an electrical wire, so I thought I would show this photo of a howler monkey running across the street. Kate of Visual St. Paul Daily Photo left a comment to my last howler monkey post asking if the are a nuisance like some of the monkeys in India. Fortunately, they are not. Howlers are shy and they stay away from people. I know what Kate means about the monkeys in India. Several of the hotels we stayed at had employees up on the roof to scare away the monkeys. A problem photographing howlers is that they are very dark, and they are often positioned in front of a lighter background, such as the sky or, in this case, the crushed rocks and shells that for the surface of the road. This photo shows a shallow Caribbean island, mostly a coral reef, with a speck of land on its eastern edge. I suspect that this will never be an inhabited island, as the sea level will probably rise faster than coral and land will add to the fledgling island. Today is Sunday, so we have new photos posted on our Viva la Voyage travel photo site this week. This week we are showing photos of the town of Adare, Ireland, which has justifiably been callled Ireland's most charming town. The flight from Costa Rica back to the USA crosses the Caribbean, if your flight goes to the Midwest or East Coast rather than California. A window seat provides view of the deep blue and shallow islands and reefs of the Caribbean, as is shown in my photo today. We have photos of our experience seeing the Opera in Paris posted on our Viva la Voyage travel photo site this week. Flying north from Costa Rica provides this view down to Nicaragua where there are windmills for generating electricity along the shores of Lake Nicaragua. I suspect that this is a good location for wind because it is a place where the land remains close to sea level between the Pacific and the Caribbean. In Costa Rica, there is a spine of tall mountains running the length of the country but Lake Nicaragua is just a half hour from the Pacific, but it drains into the Caribbean. It would therefore be a good funnel for differences in air pressure to funnel wind from across the narrow Central American isthmus. By the way, the spine of tall mountains in Costa Rica protects those of us on the Pacific coast from the hurricanes that hit the Caribbean, although the hurricane belt is north of Costa Rica. Hurricanes do not cross the mountains. This is a photo from the airliner as we left the Liberia Airpot northeast of Tamarindo to fly back to the USA. The flight path follows the Pacific coast of Costa Rica and Nicaragua, then crosses over to the Caribbean. This is one of the many undeveloped beaches along the Pacific coast. There are more undeveloped beaches in Nicaragua than Costa Rica because there is much less tourism and infrastructure in Nicaragua. How long will it be until someone buys land such as this, builds a road, develops houses, condos or a resort, and tries to attract buyers and visitors? The howler monkey who I showed yesterday who was scurrying along the wire stopped for a moment and looked back. He was checking on the rest of the pack of howlers. Howler monkeys usually travel in groups. We typically see about a dozen at a time. When they start hooting and howling it is an amazing experience. They can be heard more than one mile (1.6 km) away. The loud, deep howls sound like they must originate from something as large as a train engine, not a crature as small as a howler monkey. 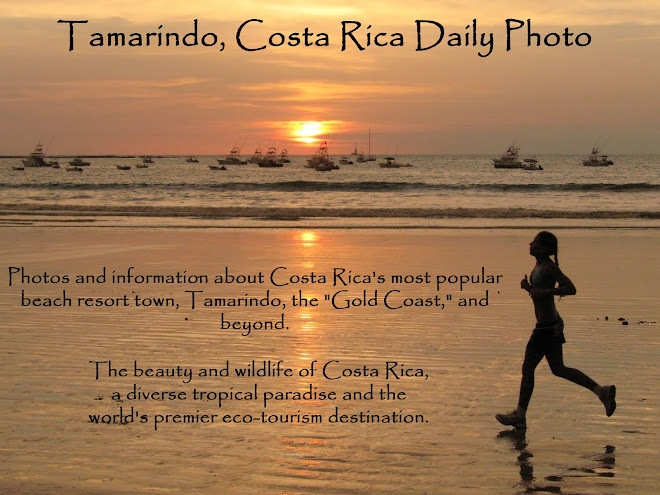 Yesterday I talked about and showed a photo of development in Tamarindo. Today I am showing that even with development, we are still close to nature. This howler monkey ran down the electrical wires on the main street in Langosta, jsut one block from the high rise condos that I showed in yesterday's photo. This was also just one block from our Langosta condo. 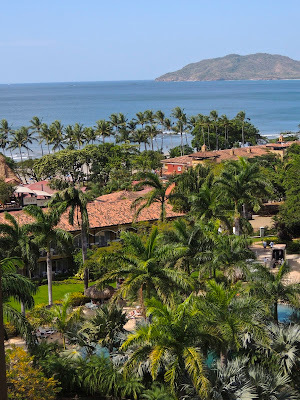 We have even seen howler monkeys from the balcony of our condo at the Tamarindo Diria Resort in the middle of town. Today's worldwide Daily Photo theme for the first of the month is "facade." Tamarindo does not have a lot of building that you would describe as having a large facade. For the facade theme I am showing the facade of two of the larger condos, the Naxos and the Peninsula. They are both in Playa Langosta. They are tall in part because the are two blocks back from the ocean, so they need the height to provide an ocean view for the units on the higher floors. It is no longer legal to develop condos this tall this close to the ocean. Tamarindo is a small beach town. The number of full time residents is only 500, but the number it can accommodate in all of the hotels, guest houses, and vacation rental condos and houses can reach nearly 5,000 during the peak season. To see how other City Daily Photo bloggers from around the world have interpreted the theme of "facades," use this link.